Specialist rainwater filter for installation within standard manhole shafts, 1000mm diameter. Connectable surface area 500 to 1000m2 depending on contamination level of the runoff. DIBt Approved. See Ch 14 SuDS manual, multi process units. The rainwater from the drained area is fed into the inlet, which is at the bottom end of the shaft. A deflector plate sets up a radial/vortex flow. Here, sedimentation of particles, especially the sand faction and above, takes place in the hydrodynamic separator. This is due to turbulent secondary flows within a radial laminar flow regime. Vortex separation. The settlable solids are collected via an opening in the silt trap chamber. This chamber is evacuated periodically, via the by-pass central tube at intervals. Four filter elements are located within the multi process filter shaft. 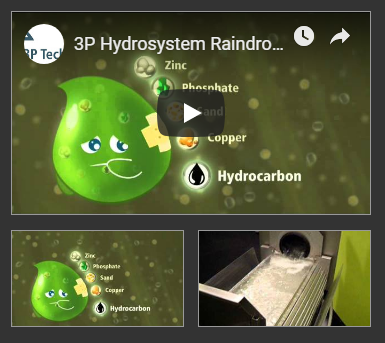 As waters flow upwards the finer particles are filtered out, whilst the dissolved pollutants are precipitated and absorbed. The filter is easily backwashed, and if completely clogged or exhausted, is easily replaced. Clean water above the filter elements passes to discharge via an oil trap assembly. In the event of major spill, free floating oils etc are retained here. 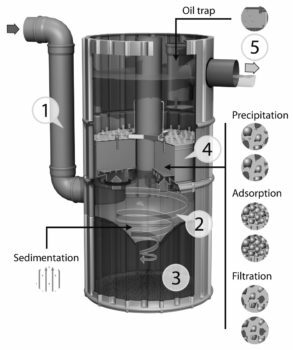 Normal concentrations of dissolved oils are retained within the filter elements. More information is available and new projects are always underway. Our stormwater products are chiefly supplied through a small selection of trained partners. The Hydrosystem multi process devices fully pass the DiBT standard, as refenced in the CIRIA SuDS manual (see Ch 14 Part D: Technical Detail, and Ch 26, Part E: Supporting Guidance). In so doing, they provide a certainty of performance standard that will be understood and accepted by the EA in England.